Modern Family could be the best modern TV sitcom. It isn’t exactly offering anything hugely original. It certainly isn’t the first sitcom to have a gay couple as central characters, nor is it the first to tackle the plight of age difference in a relationship and the trials of bringing up kids in a working family has been done to death – but Modern Family manages to keep it working even three seasons in. Not that season three is offering anything hugely original, but then again it doesn’t necessarily have to. The characters don’t have to change, the situation certainly won’t and as long the stories are relatively fresh, the series should remain successful. The characters have developed well without changing too dramatically. That is the secret to the success of the series. 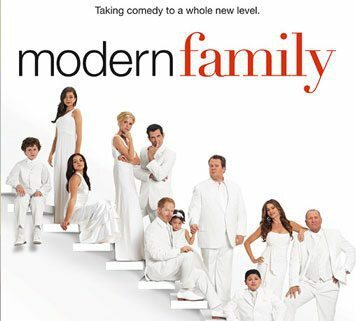 Modern Family has more main characters than most sitcoms would dare but this helps keep the series going. There are the central pairings and grouping for stories, each within their own family unit but every now and again, some very different combinations are introduced and the series takes a very different turn. One particular episode where this works very well is the Express Christmas. This sees some very random pairings, including Alex (Ariel Winter) and Mitchell (Jesse Tyler Ferguson) or Gloria (Sofia Vergara) and Luke (Nolan Gould). These are combinations that wouldn’t work in the series as usual but here they fit perfectly and make for a unique take on an episode. Most of the series fits the usual formula but this doesn’t feel too stale (yet). That is because each person is confident in their own character now. The characters haven’t quite become caricature’s (like the later seasons of Friends) and are now familiar enough for “in-jokes” and past references to work. Claire (Julie Bowen) running for local council, Mitchell and Cameron (Eric Stonestreet) trying to adopt and Hayley (Sarah Hyland) trying to get into college are all stories which work very well now the characters are established, with nothing changing the series too dramatically. With a sitcom that is as comfortable as Modern Family, familiarity is key and that is what the third season delivers. There is no huge, dramatic stories (although the finale almost leads itself down a more serious road) the comedy is non-offensive but hardly “safe” and at the end, you know where the episode will be and how the next episode will begin, which is not necessarily a negative. Not that the series is without change. It is good to see Mitchell and Cam’s daughter, played by Aubrey Anderson-Emmerson, getting decent stories and becoming a proper character in her own right. The “cliffhanger” also hints at decent story development in the future too. Overall, Modern Family’s third season is a confident, solid one for the sitcom. The characters are well-developed and have good stories to play through, while the actors embody each of them effortlessly. It will never be the most ambitious of shows but that isn’t a bad thing for a show so consistently funny as this one is. Best Episode – Express Christmas: Some of the strangest but suitably funny combinations of characters in the series so far. Should there have been another season? – Definitely. There is plenty of life left in the series yet. Next Next post: Why don’t they make good Christmas films anymore?